So often, the only projects that get "done" around our homes is dinner (and no, takeout doesn't count) and the laundry. Out of necessity though. There are so many little nagging projects that linger for most of us. Yes, we can live with a little clutter here or there, but it sure feels good to get those little things out of the way! Spring is a natural time of rebirth and shedding the layers that has descended upon our house over the winter. The Holly at Nap Time series 24 hours of Progress is designed of 72 household projects that will take on average about one hour to do. Pick one project each Monday, Wednesday and Friday to work on from now until April 1st. 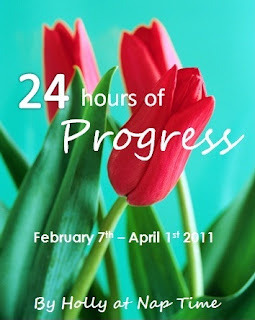 By the end of the session, you will have made 24 Hours of Progress towards the home you deserve! A lot of people tend to forget that their curtains and blinds are a part of the home that needs to be cleaned every once in awhile too. Over time they collect dust as they hang there, and if you have kids there is almost no questioning that they are also collecting other various types of grime. - Curtains: Remove carefully and take outside to shake. If you're not a fan of dust, consider wearing a surgical mask for this part. Wash and iron the curtains according to the manufacterer's instructions, and hang back in place. - Mini-Blinds: There's a lot of different ways to clean mini-blinds. However, unless you want to spread dust everywhere, I suggest taking them down and washing them in the bathtub. You'll be glad that you did! Check out this article with a step-by-step tutorial on washing your blinds in the tub. -Wooden Blinds: It's really important NOT to use water on your wooden blinds. Over time, this will ruin them, and even cause the wood to warp or become moldy. Yuck! For information on how to best clean your wooden blinds, visit this eHow article. Probably for every six times that I vacuum, I only vacuum under the couch once. Mostly because I don't feel like moving the heavy furniture around. The satisfaction I get from seeing zero dust bunnies under the couch though is always worth it. Check Out My Guest Post on Oh So Savvy Mom! Pre-Order Tangled and Get 50% Off on Amazon! !